The 2000 IR/CWCC National Championship was held at Friends Park in Bel Air, Maryland, on July 16-21, 2000. 22 captains running over 25 boats came to prove which side was better, the Axis or Allies. Unfortunately, the Allies were scared to come, and only four Allied captains had the heart to come to the Axis stronghold in Maryland. To make things more equitable, the cream of the Axis Fleet was lent to the Allies, the five Austrian-Hungarian Veribus Unitis-class battleships, affectionately known as the "Bacon Makers." All but one were operated by experienced captains with years in theirs of practive in their boats. When battle commenced Monday morning, the Axis "Monday Curse" once again took hold. 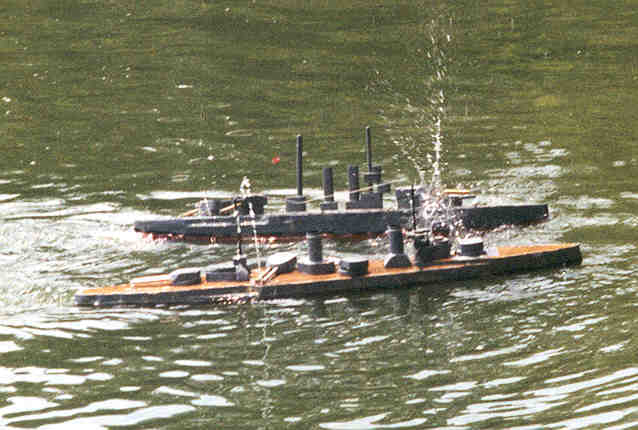 The Ed Shepard's DKM Lutzow went down within minutes of the battle's start, quickly followed by the SMS Baden just recently purchased by Dave Tuttle. D.W. Fluegel's SMS Baden burned out it's throttle and couldn't make the second sortie, resulting in a withdrawal penalty. My SMS Hindenburg lost reverse throttle control just prior to the start of the second battle and wasn't able to enter until near the end of the second sortie. So by the end of the day, and having lost both Fleet Battles, the Axis were 3300+ points behind the newly renamed "United Fleet." Tuesday didn't open any better, with the United Fleet winning both the Fleet (by 3600 points at that) and Convoy Battles (by 1800). After a disappointing showing last year in North Carolina, the Axis again "Ruled the Night," taking Wednesday's Night Battle 3650 to 1985. A 3000 point victory in Thurday's Fleet Battle and a tie in the Convoy Battle made Friday's one Fleet Battle a "do-or-die" proposition for the Axis, being only 4000+ points behind the United Fleet. But even though the Axis won, they didn't win by enough and so lost Nats by approximately 2100 points.